A method to attach outsole to upper with stitching through insole and outsole. Due to the direct attachment without any intermediate layer, a thinner outsole can be used making the shoe lighter and more flexible than other comparable construction methods such as goodyear construction. The method is also known as McKay method or Littleway. Firstly following the normal process for majority of constructions the upper is stitched, and and insole is matched with the last. The upper is pulled over the last creating a small cavity in the bottom between the upper and the insole due to the thickness of the upper. To get a more stable shoe, a shank is used (commonly a metal piece) integrated in the insole but it can also be applied separately, if so it´s positioned in this cavity. For the remaining gap between the insole and bottom upper fold a filler is used to create an even bottom platform. This filler can be a wide range of materials, normally cork on high end shoes and textile or nonwoven mix on others. Heel lasting of shoe. At this point process is same for blake or cemented construction. With the upper lasted and prepared with an even bottom contact a midsole is attached, kept in place by glue. The last is removed and to ensure a mechanical bond the insole is stitched together with the midsole, known as Blake stitching. 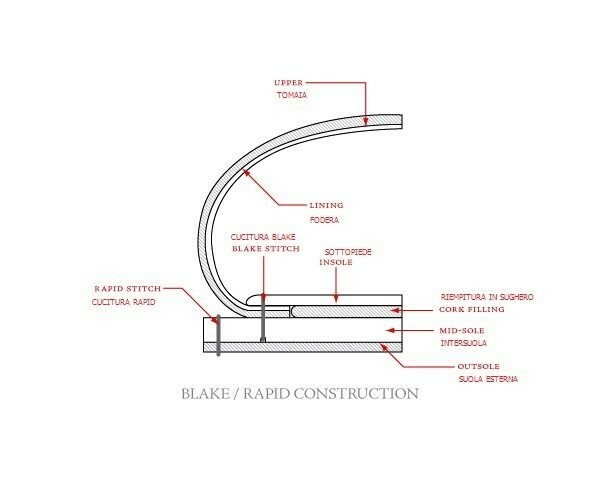 This is the differentiating step between Blake and Blake Rapid construction. 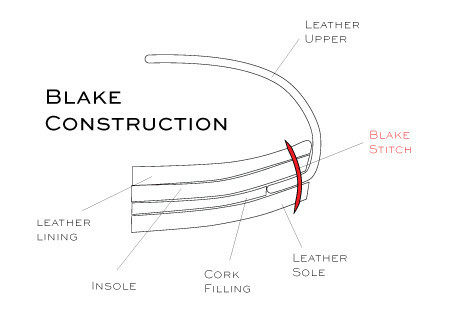 In Blake construction a one layer outsole is used, treating the “midsole” as the outsole. This makes the blake stitchings not only be visible in the insole but also the outsole. This one layer outsole construction allows for a very thin outsole, sleek look and flexible shoe. Waterproofing is compromised from the needle holes from the stitches. Blake Rapid follows how Blake is constructed with the difference that an outsole will be attached, covering the blake stitches underneath. To ensure a good bond a stitching, known as Rapid stitching, is introduced around the perimeter of the midsole and outsole, creating a welted look. This extra outsole covers the bottom part of the shoe making it more water resistant, repairable and durable. However, it increases the thickness and flexibility. Rapid vs Blake stitching, what is the difference? At it´s core it´s the same thing, stitching through a sole to bond two components together. However, two different machines needs to be used depending on the purpose. The Rapid stitching machine is generally used for stitching through a welt to attach an outsole to midsole and an upper construction. The Rapid machine is relatively straight forward, just more powerful than a normal stitching machine. Blake stitching however, is always done inside the shoe, after lasting the upper and that the last is taken out again. 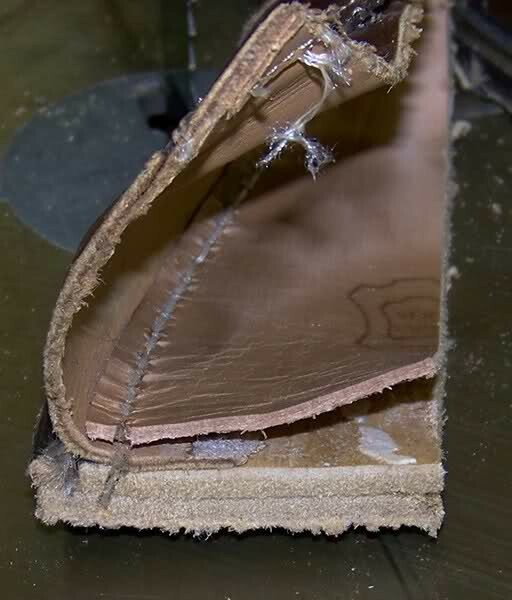 Since the stitching is done inside the shoe the Blake stitching machine has a characteristic arm to support the stitching. Italian sewing machine company Falan Blake stitching. To left from 1946, to right from 2006. Note the arm on the machines to be able to reach inside a shoe. Lyman Reed Blake (1835-1883) from Massachusets USA, started at young age to work with shoe production with his elder cobbler brother. after a couple of years he started to work for Isaac Singer and his company Singer Corporation which very successfully were manufacturing sewing machines. Blake made a career there and became partner at Singer Corporation 1856. At the same time he was experimenting in combining his background in footwear and more automatic sewing. 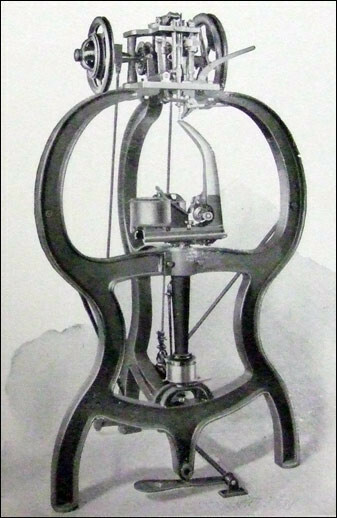 This gave result and 6th July 1858 he got a patent approved for a machine that could stitch togehter upper, midsole and outsole. 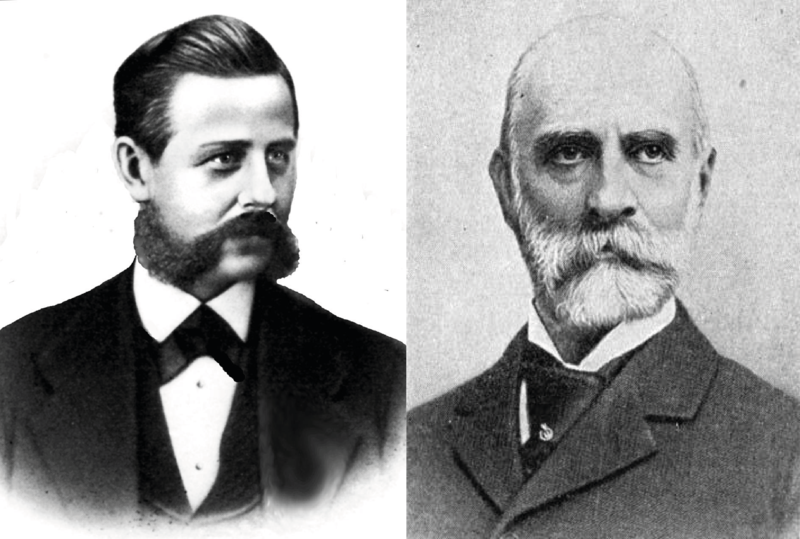 In 1859 he sold the patent to the businessman and engineer Gordon McKay at a price of 8000 US$ cash and an additional 62 000 US$ based on future profits. Blake quit his job at Singer Corporation and started to work for McKay on improving the machine. McKay contributed to this not only by his own knowledge but he also had a machine workshop employing about 100 people. 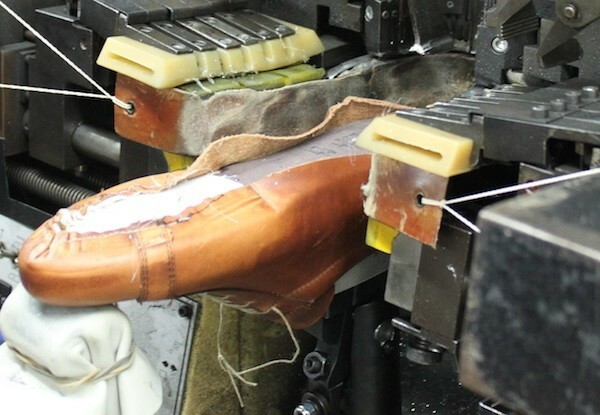 The big benefit with the Blake machine was the efficiency and speed at which shoes could be made at compared with traditional hand sewn methods common during the 1850's. They tried to introduce the machine to cobblers but no one believed in the invention and did not trust that the machine could facilitate their job. They were also skeptical towards making a relatively big investment in a technology not seen before mainly focused on one production process. A Blake machine powered by hand. A big turning point was 1861 when the American Civil war broke out. Many of the cobblers were called to the army and at the same time the demand for footwear increased. A quick and productive production was now necessary. McKay knew he needed to circumvent the investment barrier and he got the idea to just place machines at cobblers. Instead of paying for the machine he would take a price for every shoe produced with the machine. In this was there was no investment needed from the cobblers, they would have the freedom to change and with time he could make a bigger profit than just selling machines. It was in the biggest interest for McKay to ensure that the machines were constantly running since this was his source of income. He established a team only focused on service and maintenance of the machines. 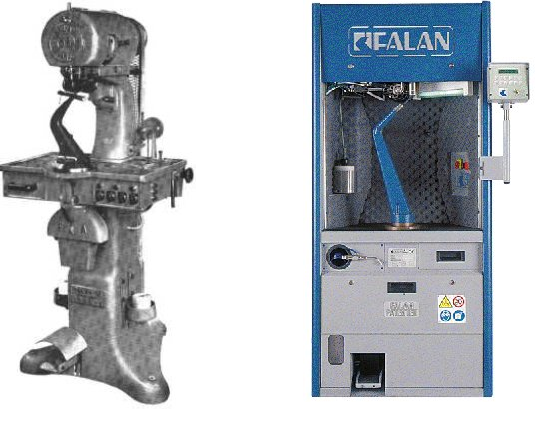 The Blake machine did not only create a small revolution in the footwear business but the way to lease machines have also played a big part for the industrial industrialization process. The first blake machines were run by hand and later on, together with the general development, steam powered to currently be run by electricity. What´s the difference between Blake and Goodyear welted? There are multiple differences. Read all about the Goodyear welted construction here. In general terms the Blake is a more flexible construction due to fewer layers of materials needing to be used. A Blake construction doesn't need both a midsole and outsole but can use one layer of sole. The Goodyear welted shoe uses gemming (rib) for welt attachment. Blake stitched shoes doesn't need to have a welt but can be single stitched. Blake stitched shoes need a Blake stitching machine to be resoled, Goodyear welted shoes use more standard equipment. Blake stitched or goodyear welted? From a picture like this it can be difficult to tell if it´s a Goodyear welted or Blake stitched shoe. Then turn the shoe around and the stitching pattern might give you a clue. If the stitching is not following the outsole around fully then it´s an indication that it might be blake stitched. The best way is to remove the insole and check if the stitching is punching through the midsole to the outsole. If this is the case then it´s guaranteed Blake stitched.